Professor J. David Singer has been arguably the most important influence on quantitative research into the causes and attributes of war. His pioneering work on the Correlates of War project at the University of Michigan and his numerous books and articles have inspired generations of researchers in the fields of international relations, conflict analysis, security studies and peace science. 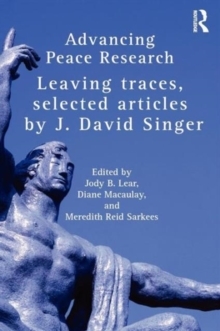 This collection is a carefully selected overview of his work which provides not only an excellent introduction to his considerable methodological, theoretical and empirical contributions but also an intellectual history of developments in the field of international relations which are reflected in Professor Singer's work. This is essential reading for all those with an interest in the use of quantitative methods in social science, the changing nature of the study of international relations and the analysis of war and peace.